Bissell Crosswave vs. Symphony - Which Vacuum Mop Combo is Best? Curious as to how it can be possible to vacuum and mop all at once? Bissell seems to have hit that sweet spot. This week we’ll be taking a look at the Bissell Crosswave vs. Symphony and seeing which one takes the crown. Which of these two vacuum mopping combos is the King of floor cleaning? Continue below to find out! The Bissell Crosswave and Bissell Symphony are designed in a fairly similar manner, but they do have their differences. For the most part, they both utilize an upright design, meaning they stand up much like an upright or stick vacuum, only they have the power to both mop and vacuum. With regard to design, these two Bissell’s have a lot in common. They’re overall shape and size is similar, but the makeup of the vacuum is slightly different. To start, both of the handles house the power / cleaning mode buttons. As you move down the body of the unit, the Crosswave and Symphony both have a dust cup in the center of their body. That said, the dust cup on the Crosswave holds both water and dirt / debris from a cleaning session. On the other hand, the Symphony only holds dry debris, no moisture. Therefore, cleaning / emptying the dust bin on the Symphony is a bit easier than the Crosswave. Once you move down to the cleaning head, there are a few more differences. The cleaning head on the Crosswave looks more like a vacuum with a motorized brushroll. The Symphony has more of a steam mop look but combines the vacuum head as well. The cleaning pad sits on the back half of the head while the front half is left open for vacuuming. Aesthetically speaking, the Bissell Crosswave and Symphony look quite the same when it comes to the build of each unit. However, the colors are different. The Crosswave offers a lime green and gray color scheme whereas the Symphony has a blue and gray combination of colors. Bissell Symphony Pet Steam Mop – The Symphony pet model is best suited for those who need to sanitize and vacuum their floors due to pet hair and body oils. Since the Symphony uses the power of steam, it’s able to sanitize. Bissell Crosswave Pet Pro – The Bissell Crosswave Pet Pro offers a more general purpose floor cleaner. It doesn’t have steam the to sanitize, but the rotating brushroll is able to deeper clean in some cases. CLEANING HEADS | Probably the biggest difference between the Bissell Crosswave and Symphony are the cleaning heads. Although they both have the ability to vacuum, the way they mop is different. The Bissell Crosswave has a cleaning head that looks more like a traditional vacuum head. There is a motorized brushroll within the cleaning head that allows the unit to mop your floors with water and cleaning solution. Once the user turns the Crosswave on, the brushroll begins to spin and the suction power of the unit kicks on. As the trigger on the handle is squeezed, cleaning solution is added to the brushroll, creating a brush that has the ability to now clean your floors. On the contrary, the Bissell Symphony has less of a traditional vacuum head look and more of a steam mop look. The front end of the Symphony’s head acts as a vacuum while the tail end contains a cleaning pad that is used to steam mop your floors. So unlike the Crosswave, the Symphony does not have a motorized brushroll, but instead has a flat pad that uses steam to sanitize and clean your floors. SURFACE TYPES | Each of these Bissell mops / vacuums is able to clean hard floor indoor surfaces. With a few different cleaning modes offered by each unit, the way they clean these floors is unique to each model. That said, the Crosswave does have the edge in terms of versatility, as it is able to clean more than just hard floors. The Bissell Crosswave has a few options when it comes to the brushroll. One is made specifically for area rugs, another is made for hardwood floors, and the final version is good for multiple surface types. The Symphony, however, is only to be used on hard floor surfaces, such as hardwoods, tile, linoleum, etc. RELATED | See more awesome mops and robot mops here. The Bissell Crosswave stands at 46″ tall, 12″ wide, and weighs 11 pounds. This is a bit smaller than the Bissell Symphony, but not by much. The Symphony is 46.5″ tall, 11″ wide, and weighs in at 10.1 pounds. Although these two are slightly different, the differences in size are not enough to dramatically change how hard each one is to maneuver. What accessories come with Crosswave & Symphony? Both the Crosswave and Symphony are available in a few different versions, each of which includes some different parts and accessories. The accessory information below details what comes with the most popular / standard versions of the Crosswave and Symphony. Multi-Surface Cleaning Head: The Bissell Crosswave includes a multi-surface brushroll that works to agitate and lift dirt and debris while also mopping the floors. Cleaning Pads: The Bissell Symphony includes two cleaning pads; one is a smooth pad for mopping and the other one is a scrubbing pad that helps agitate sticky residue. Cleaning Solution: Both mops include a cleaning solution. There are more specific cleaning solutions included with some of the bundles offered by these mops. That said, you also have the option of creating a homemade cleaning solution, which could be cheaper in the long run. Cleaning Tray: A cleaning tray is included with the Bissell Crosswave. Cleaning solution and water can be sprayed into the tray, which can be followed by running the unit in the tray to run fresh cleaning solution through the brushroll. Filter: Both the Crosswave and Symphony include a washable filter. This filter should be washed and replaced every major cleaning session / cycle. Although they are washable, the filters will wear and need to be replaced over time. The following mop test and analysis are designed to show how the Bissell Crosswave and Symphony perform when mopping up a variety of substances. For our cleaning tests, we look at mud / dirt, honey, and liquid. Additionally, we also include research and analysis from other reviews to help gauge performance. To begin with, we have not yet personally tested the Bissell Symphony. Our testing data is based on a wide variety of other reviews as well as our best opinion on how we believe it would perform. That said, we have competed for our testing process on the Bissell Crosswave. The Bissell Crosswave performed exceptionally well during our cleaning tests. Each of the debris we tested the Crosswave against were cleaned up to a level of 90% or higher. After one pass was made across the mud, honey, and soda, we saw scores of 100%, 90-95%, and 95%+, respectively. As we began making more passes across our testing lane, we found that the remaining honey was completely cleaned up and the soda was not far behind. The issue with soda came from pooling in the corner of our lane, as well as up against the baseboards. Unfortunately, the Crosswave was not able to reach into those areas and clean up the soda. Therefore, this Bissell peaked at a little over 95% cleanliness, with regard to the soda test. Liquids that push to the baseboard or wall may be harder for the Crosswave to clean. Based on the cleaning performance of the Crosswave, we would expect the Bissell Symphony to perform in a similar manner. The vacuum portion of the unit should do a nice job of grabbing any larger chunks of mud / dirt, while the steam pad should be able to remove the stuck on mud and honey. Now, we would expect the soda test to score close to the Crosswave, but I am worried that the steam cleaning pad would try to soak up the soda and end up dragging it across parts of the lane (which we’ve experienced with other steam mops, including Shark Genius and Hoover Twin Tanks). After a single cleaning pass, the vast majority of honey was removed, with a slight residue remaining. After pass #2 virtually 100% of the honey was removed. 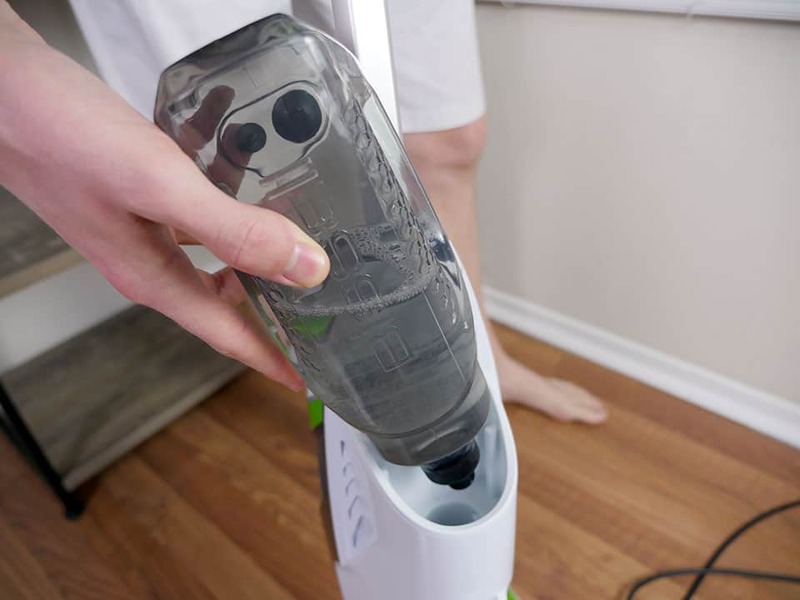 There is a good chance it is sucked up by the vacuum portion of this unit, but that may not be the best choice when cleaning up the soda with this Bissell steam mop. All things considered, these two should be fairly similar, but I do believe the Crosswave has its benefits with liquid. On the other hand, there is a good chance that the Symphony does a better job of cleaning up honey in a single pass, due to the steam cleaning method. For our comprehensive testing data see our full Bissell Crosswave review. Unfortunately, we have not tested the Bissell Symphony and do not have a standalone review at this time. RELATED | If you’d prefer a standalone vacuum to go with your combo mop, see our full list of vacuum reviews, or check out some of our favorites including the Dyson V8, Shark Navigator, and Miele Compact C1. How easy is it to use the Crosswave & Symphony? UNBOXING | Unboxing the Bissell Crosswave is simple. Each piece is individually wrapped, so you will have to unwrap each of them, but this is not a long process. The Bissell Symphony process should be almost identical to the Crosswave. SETUP | Once you’re ready to setup the Crosswave all you have to do is slide the handle into the body of the mop and screw it in. This process can be completed in 2 minutes or less. The Bissell Symphony requires a short assembly process as well. Slide the body of the unit into the cleaning head and wait for the snap sound. Once you’ve found that the body clicked into the head securely, the Symphony is ready for use. RELATED | Rather not mop at all? Check out some of our robot mop reviews. Both the Braava 380t and Braava Jet 240 are some of the top options. DAILY USE | When it comes to using the Bissell Crosswave users must add water and cleaning solution, plug the unit in, select the floor type cleaning mode, and begin cleaning. Once the Croswave is on and running, the trigger on the handle must be pulled in order to release cleaning solution onto the brushroll. To remove the cleaning solution water tank along the back, simply pull up and out from the unit. The Bissell Symphony adapted the same process for the most part. Add water, plug it in, and select the floor type and whether you would like to vacuum or steam clean. There are two tanks on the Crosswave, but only one of them needs to be emptied; the dirty tank housed on the front of the unit. This tank has a small latch that can be squeezed to remove the tank, which then allows users to empty the debris and moisture into a trash can. The clean water tank can be removed by pulling it straight up and filled by removing the top cap. The dust bin on the Symphony utilizes a dry tank technology, meaning no moisture is able to get into the dust bin, so the debris is much easier to empty. There is a small latch on the bin itself that can be pressed in to release the top of the dust bin. How easy are they to maneuver? When looking at the overall maneuverability of these two Bissell mops, there is not much of a difference. PORTABILITY | The Bissell Crosswave weighs 11 pounds while the Symphony brings home a total weight of 10.1 pounds. The difference is less than a pound so it’s not a huge factor, but the Symphony is easier to push around with a lighter weight. CLEANING ANGLE | Cleaning angle is not an area where either of these truly excels in. There may be times when getting into or around those tighter spots become an issue. CORD LENGTH | The cord length on both the Bissell Crosswave and Symphony is 25′ long, which gives users a nice cleaning radius. Cordless is typically better when it comes to maneuverability but with a longer cord, users are able to clean larger rooms in the home. Maintaining each of these mops is easy. The most important tasks to focus on are emptying the dust bins, replacing the cleaning pad or brush, and replacing the filters. Maintaining filters on each of these units is of the utmost importance. The Bissell Crosswave only has one filter that needs to be changed, and it is a washable filter. Users can remove the filter, wash it, let it dry, and replace it before having to purchase a brand new filter. The Symphony has two filters that need to be cleaned / replaced. The first is the vacuum filter. Remove this filter, knock the dust off of it, into a trashcan, and replace it. Once again, this filter will need to be replaced periodically, depending on how often the vacuum is used. The second filter is the water filter. This filter is also quite easy to maintain, as the filter has small green grains that will turn blue when the filter needs to be changed. The brush on the Crosswave needs to be periodically checked for any tangles from hair, strings, etc. It should also be removed once wear is noticeable. The Bissell Symphony uses a cleaning pad that’s washable. However, it will eventually need to be replaced. The timing of replacement really depends on the amount the Symphony is used. Bissell Crosswave annual maintenance costs land around $40 / year. The Bissell Symphony is not far off, coming in at $33 / year to maintain. All things considered, the Bissell Crosswave offers a great value. The price is certainly reflective of the performance you receive. This Bissell is able to act as a vacuum, hard floor cleaner, and area rug cleaner all at the push of a button. The Bissell Symphony also offers a solid value. The cost of this specific unit is about $100 less expensive than the Crosswave and based off of the information we have gathered, the performance does seem to be similar. 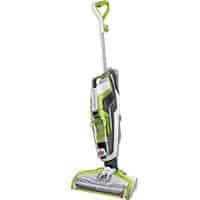 Although this specific Bissell cleans through vacuuming and steam power, the versatility of this unit is certainly a positive. Weight 11 lbs. 10.1 lbs. 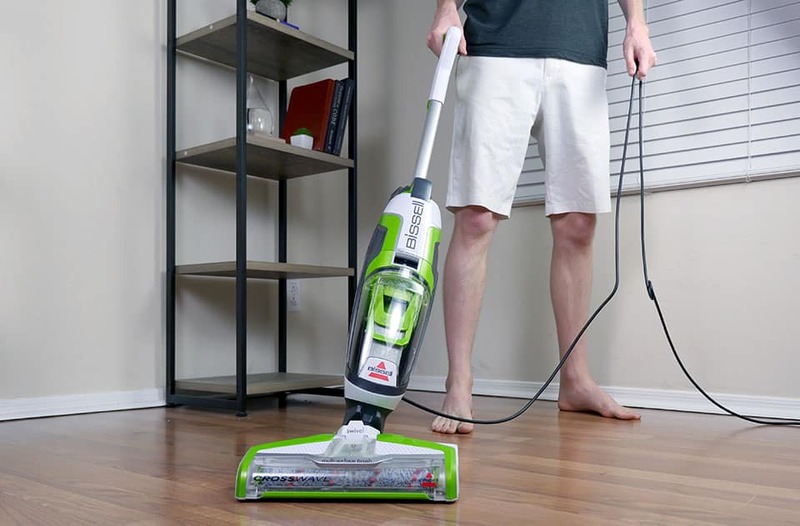 The Bissell Crosswave uses a motorized brushroll to clean while also vacuuming. The Bissell Symphony lacks the brushroll, but can still vacuum and sanitize with steam cleaning. The Bissell Crosswave is able to clean on all indoor hard floor surface types as well as area rugs, whereas the Bissell Symphony is to be used strictly on indoor hard floor surfaces. Should You Buy the Bissell Crosswave? The Bissell Crosswave is a powerful wet dry vac that is designed to give users the opportunity to vacuum while also mopping and deep cleaning your floors / area rugs. Want a strong performer – The Crosswave does a great job when it comes to cleaning performance. This unit was able to handle sticky residue on the floor as well as a good amount of standing liquid. Like the idea of being able to clean area rugs in addition to hard floors – This Bissell is able to clean both hard floor indoor surfaces as well as area rugs. If you’re looking to deep clean your area rugs as well as your hard floors, the Crosswave could be a good choice. See here for more information or to buy the Bissell Crosswave. Should You Buy the Bissell Symphony? The Bissell Symphony is another well-rounded unit that offers steam cleaning and vacuuming all in one. Want a vacuum and steam mop all in one – The Bissell Symphony has the ability to vacuum as well as steam mop. These modes can be used together or separate, and are easily controlled by buttons along the handle of the unit. Want a less expensive unit – The Symphony is less expensive than the Bissell Crosswave. If you’re looking to save a few bucks and like the idea of a steam cleaning vacuum, then the Symphony could be a good fit for you and your home. See here for more information or to buy the Bissell Symphony.